Ovariectomy and ovarian tissue cryopreservation has the potential to preserve the natural fertility of cancer patients prior to sterilizing chemo- and radiotherapies. Ovarian tissue cryopreservation with the conventional slow-freezing method has yielded limited success, partly because of oocyte loss during freeze–thaw and subsequent transplant. Based on the high-efficiency vitrification Cryotop method, a practical vitrification procedure for murine, bovine and human ovarian tissue was developed. A Cryotissue method was designed for cryopreservation of ovarian tissue, and vitrification experiments were performed in a bovine animal model with ovarian size and structure similar to the human. There was no difference in oocyte viability (>89%) between fresh and vitrified ovarian cortical tissue in either bovine or human samples. Ovarian tissue was successfully autotransplanted to six cattle. Autotransplantation of vitrified–warmed tissue back to the cattle resulted in no loss of oocyte viability. In addition, human ovarian tissue from cancer patients, and from ovary transplant donors was also vitrified by the Cryotissue method. After warming, high oocyte survival in human tissue (similar to bovine tissue) was obtained. These results indicate that an ultra-rapid cooling vitrification method has the potential for clinical use in human ovarian tissue cryopreservation. It has been estimated that about one in 250 women of reproductive age are cancer survivors (Bleyer, 1990). Enthusiasm has therefore been generated for young female cancer patients to undergo oocyte or ovarian tissue cryopreservation before their cancer therapy in order to preserve their chance for future pregnancy (Gosden et al., 1994; Kuwayama et al., 2005a; Donnez et al., 2004a,b, 2005, 2006). Cryopreservation of oocytes, although seemingly easier for the patient than ovarian tissue freezing, is actually problematic for pre-pubertal girls and for women who do not have enough time to collect mature eggs before their cancer therapy begins. In that event, ovarian tissue cryopreservation makes it possible to preserve more oocytes, without hormone treatment, for both in-vivo oocyte maturation and for subsequent transplant of ovarian tissue back to the patient after cure of the cancer (Kagawa et al., 2007). Even very young girls with Turner syndrome might be able to have their ovarian tissue preserved for later autotransplantation (Weiss, 1971; Lippe, 1991). Children have already been born from fresh transplanted ovaries and from ovaries cryopreserved by the classic slow-freezing method (Donnez et al., 2004a,b; Meirow et al., 2005; Andersen et al. 2007; Demeestere et al. 2007; Silber et al. 2008). In each such frozen case, however, the ovarian function ceased after birth of the baby or by 3 years post-operation (Donnez et al. 2004a,b; Silber et al., 2005, 2007, 2008). Although the slow-freezing technique thus has been used for human ovarian tissue preservation and transplantation with success, the percentage of viable oocytes is very severely compromised. It has not been entirely clear to what extent the slow-freezing method might have affected the post–thaw viability rate of oocytes, and if this might limit the duration of function of these grafts after thawing and transplantation. In fact, the compromise in oocyte number in transplanted ovarian tissue is due to the freezing method as well as the ischaemia time of the transplant technique (Baird et al., 1999). Matured oocytes are very sensitive to cooling and difficult to cryopreserve by slow-freezing methods (Oktay et al., 2006). However, ultra-rapid vitrification [see video] has solved these difficulties for the most part, and egg freezing is very efficient today (Martino et al., 1996; Kuchenmeister and Kuwayama, 1997; Kuwayama et al., 1997; Vajta et al., 1998; Nagashima et al., 1999; Kuwayama et al., 2005a,b; Cobo et al., 2007; Nagy et al., 2007; Homburg et al., 2008). The reason for this success is that after dehydrating and concentrating the cell with high-density cryoprotectant agents (CPA), vitrification allows immediate non-crystallization (amorphous state) freezing. Chilling injury to the cell is also avoided and ice crystal formation is not generated. The question raised in this study is whether ultra-rapid vitrification can also improve results with ovarian tissue. There have been countless reports on oocyte loss during ovarian cryopreservation using a slow-freezing methodology in mice, rats, sheep and humans. However, precise data on the preservation efficiency of oocytes in ovaries by vitrification is unknown, and an ideal ovarian cryopreservation method has not yet been established (Gook et al., 1999; Newton et al., 1996; Sugimoto et al., 2000; Oktay et al., 2001, 2004; Migishima et al., 2003; Courbiere et al., 2006). Furthermore, there has been no study yet to determine whether ischaemic oocyte loss after cortical transplantation can be prevented by a different cryopreservation protocol. This study compared the oocyte viability rate in ovarian tissue before and after cryopreservation by vitrification, first in the bovine ovary, and then in human ovarian tissue, to try to establish an effective ovarian vitrification protocol. Then ovarian cortical autotransplantation was performed in the cow using tissue that had been vitrified with this protocol and then warmed. Histological analysis evaluated maintenance of tissue structure and analysis of reproductive physiology evaluated function of ovaries. Based on these results, a clinical technique for human ovarian vitrification (the UltraRapid Vitrification Cryotissue method) was then developed. Finally, human ovarian tissue cryopreservation using the same protocol in clinical cases was investigated. Figure 1: Vitrification procedure: the Cryotissue method. The ovarian tissue slicer was developed, with a plate to produce 1 × 10 × 10 mm slices. (1) The tissue slicer was put on the surface of ovary. (2) Then another plate was put on the tissue slicer, the ovary was cut between the slicer and the surface of ovary by using a sharp edge. (3) The ovarian tissue was cut into 1 × 10 × 10 mm slices. Because the size and the structure of the bovine ovary are similar to the human ovary, bovine ovaries were used as a model for human ovaries. Both ovaries were obtained from three Holstein cross-bred cows slaughtered at a local abattoir. All six ovaries were transported to the laboratory in saline solution at a temperature ranging from 12°C to 14°C within 12 h from collection. Ovaries were rinsed in sterile Dulbecco’s phosphate-buffered saline (D-PBS) before removal of the 1-mm-thick outer layer of the ovarian cortex. Areas with prominent follicles and corpora lutea were discarded. Figure 3: Surviving oocytes (arrows) of pre-antral follicles of vitrified–thawed bovine ovarian tissue (Hoechst/propidium iodide stain). Scale bar represents 50 μm. 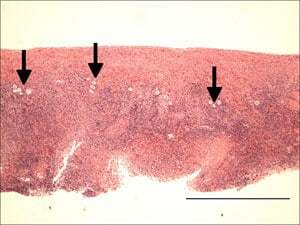 Figure 4: (A) Gross morphology of bovine ovary with vitrified ovarian tissue immediately after autotransplantation. Ovarian cortical piece measuring 1 × 10 × 10 mm in size was grafted onto the ovary after the cortex of this ovarian tissue had been removed and vitrified. Cortical piece was sutured and marked using the nylon strings. (B) Gross morphology of bovine ovary with vitrified ovarian tissue 44 days after autotransplantation. Marking by the nylon strings of the graft is clearly visible (asterisk). Scale bars represents 10 mm. Cortex fragments of each ovary were cut into pieces 1 × 10 × 10 mm. Tissue slices from one ovary of each cow were examined fresh, and from the other ovary of each cow were examined after vitrification and warming. The precise 1 mm tissue thickness was guaranteed with a tissue slicer designed explicitly for this purpose (Figure 1). In brief, the tissue slicer plate has a 1 × 10 × 10 mm cubic space. The tissue slicer was put on the surface of ovary. Then another plate (holeless) was placed over the tissue slicer, and the ovary was cut between the slicer and the surface of ovary using a sharp edge. The cortical ovarian tissue was thus cut into 1 × 10 × 10 mm pieces. The ultra-thinness of the tissue was thought to be crucial, not just for the cryopreservation, but also for the rapidity of revascularization after grafting. Following the procedure described by Kagawa et al. 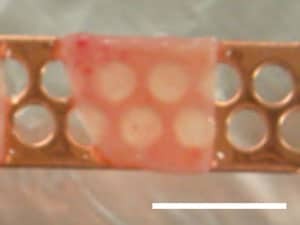 (2007), with some modifications, the Cryotissue method was applied to large pieces of ovarian tissue (1 × 10 × 10 mm) from cattle and humans with a modified concentration of CPA during vitrification and extension of the soaking time compared with that used for small pieces ovarian tissue (0.2 mm3) in mice. Ovarian tissues were initially equilibrated in 7.5% ethylene glycol (EG) and 7.5% dimethyl sulphoxide (DMSO) in handling medium [HM; HEPES-buffered TCM-199 solution supplemented with 20% (v/v) synthetic serum substitute (SSS; Irvine Scientific, Santa Ana, CA, USA)] for 25 min followed by a second equilibration in 20% EG and 20% DMSO with 0.5 mol/l sucrose for 15 min. Ovarian tissues were then placed in a minimum volume of solution onto a thin metal strip (Figure 2) (Cryotissue; Kitazato BioPharma, Fujinomiya, Japan), and submerged directly into sterile liquid nitrogen (Fuentes and Dubettier, 2004), following which the strip was inserted into a protective container and placed into a liquid nitrogen storage tank. For warming, the protective cover was removed and the Cryotissue metal strip was immersed directly into 40 ml of 37°C HM solution supplemented with 1.0 mol/l sucrose for 1 min. Then, ovary tissues were transferred into 15 ml of 0.5 mol/l sucrose HM solution for 5 min at room temperature, and washed twice in HM solution for 10 min before viability analysis, or transplantation. No ice crystal formation was observed during any of the procedures. During the cooling and warming procedures, accurate measurements of cooling rate and warming rate were obtained (Thermo Pro 3000; Keyence, Osaka, Japan). For viability analysis, oocytes were collected from both fresh ovarian tissue (control group) and vitrified and then warmed ovarian tissue (experimental group) using mechanical dissection with 27-gauge needles and treatment with collagenase (Clostridium histolyticum; Wako, Osaka, Japan) at 1 mg/ml in phosphate buffered saline for 10 min. Viability analysis of oocytes from ovarian tissues was performed by fluorescence microscopy after staining with propidium iodide and Hoeschst 33342 (Figure 3). Two Japanese black cattle (59.8 months old, 490–665 kg) underwent two surgeries. They were anaesthetized with epidural anaesthesia using 0.17 ml/10 g body weight of Lidocaine HC1 (Xylocaine solution; AstraZeneca, London). During the first surgery, each ovary was exposed and slices were obtained using a microtome type blade with the Cryotissue device, making certain the ovarian cortex was only 1 × 10 × 10 mm (Figure 1). The tissue was then immediately vitrified using the Cryotissue technique already described, and stored at –196°C in liquid nitrogen. After warming, the left ovarian cortex was sutured onto the orthotopic (original) sites using 9–0 prolene and the right tissue slice was similarly sutured onto the right orthotopic sites (Figure 4A). A total of four pieces of vitrified–warmed ovarian tissue were thus transplanted back to the two cattle (two pieces per cow). After the graft procedure, the cows were returned to the cattle shed. These ovarian grafts were removed surgically 44 days after autotransplantation (Figure 4B) to analyse histologically. The vitrified–warmed autotransplants were rinsed in D-PBS and then immediately fixed in 10% phosphate-buffered formalin (pH 7.4; Wako), dehydrated through a graded ethanol series and embedded in Histosec (Merck, Darmstadt, Germany). Serial sections 3 μm thick were stained with haematoxylin and eosin. The numbers of follicles in the grafted ovarian site of the vitrified and non-vitrified areas in cattle were counted. A total of four Japanese black cattle were bilaterally ovariectomized, and then ovarian tissue from all eight ovaries were vitrified by the Cryotissue method. Blood samples were taken every 2 weeks after ovariectomy to verify the cessation of ovarian function. After complete cessation of cycles, vitrified ovarian tissues were transplanted under the neck skin of each cow (five pieces per each cow). Blood samples were then taken every 2 weeks after this transplantation to evaluate the recovery of ovarian function. Two months after autotransplantation the animals received equine chorionic gonadotrophin injections (500 IU Serotrophin; ASKA Pharmaceutical, Tokyo, Japan) dissolved in physiological saline, which were injected three times intramuscularly. Blood samples were collected from a coccygeal vessel every 2 weeks after the ovariectomy and after the transplantation of vitrified ovarian tissues to evaluate the ovarian function. Serum concentration of oestradiol was determined by radioimmunoassay (Taya et al., 1985). Ovine anti-serum raised against oestradiol-17β was provided by Dr GD Niswender (Colorado State University, Fort Collins, CO, USA). The intra- and interassay coefficients of variation were 7.0% and 12.7% for oestradiol. Ovarian tissue was obtained from seven ovarian cancer patients ranging from 38 to 40 years of age. Biopsies were performed on the healthy contralateral ovary from areas free of visible follicles and avoiding the hilus. Samples were transported from the surgical theatre to the laboratory in saline solution at 7°C and were processed immediately for vitrification. Approval for tissue recovery and cryopreservation had been obtained from the local institutional review board. Patients provided written informed consent regarding the use of their ovarian tissue and regarding the risks linked to the surgical procedure. The cortex of each ovary was cut into pieces 1 × 10 × 10 mm. The tissue was first rinsed in HM, and then equilibrated for 25 min at room temperature in equilibration solution (7.5% EG, 7.5% DMSO, 20% SSS in HEPES-buffered TCM-199). At the end of the equilibration period, the tissue was transferred into a test tube of vitrification solution (20% EG, 20% DMSO and 0.5 mol/l sucrose) for 15 min, or until it sank to the bottom of a test tube indicating complete absorption. Samples were then placed in the minimum amount of vitrification solution on the Cryotissue metal grid and were plunged directly into liquid nitrogen. At least 2 days later, samples were warmed directly by placing the Cryotissue metal grid into warming solution (1.0 mol/l sucrose in HEPES-buffered TCM-199 with 20% SSS) (Kitazato Biopharama) at 37°C for 3 min and then into 0.5 mol/l sucrose solution at room temperature for 5 min. No ice crystal formation was observed during the procedures. Ovarian tissues were then rinsed twice in HM solution and immediately were fixed in 4% paraformaldehyde. A part of these ovarian tissues were stained with propidium iodide/Hoechst 33342 to analyse survival rate. For microscopic analysis vitrified–warmed ovarian tissues were fixed in 10% phosphate-buffered formalin (pH 7.4; Wako), dehydrated through a graded ethanol series and embedded in Histosec (Merck). Serial sections 3 μm thick were stained with haematoxylin and eosin. After fixation, fragments were embedded in paraffin wax, and serial sections of each fragment were taken at 100 μm intervals. Sections were stained with haematoxylin–eosin, and follicular structures were evaluated for morphological normality. Cells were evaluated for proliferation using immunohistochemical technique: immunostaining with a specific antibody against proliferating cell nuclear antigen (PCNA). To visualize the proliferating cells, tissue sections were immunohistochemically stained for PCNA. Briefly, they were dewaxed in xylene, rehydrated in descending concentrations of ethanol, and washed in distilled water. Endogeneous peroxidase activity was quenched with a 10 min incubation in 3% (v/v) H2O2 in Tris-buffered saline (TBS; 0.05 mol/l Tris–HCl and 0.15 mol/l NaCl, pH 7.6) at room temperature (22–25°C). After a wash in TBS, the sections were incubated with horseradish peroxidase-conjugated mouse monoclonal anti-PCNA antibody (1:200; Dako, USA) for 1 h at room temperature, and then washed well with TBS. Positive cells were demonstrated by staining with liquid 3,3-diaminobenzidine substrate (EnVision kit; Dako). The sections were counterstained with haematoxylin, washed with distilled water, dehydrated, mounted with Entellan and examined by light microscope. As negative controls, adjacent sections incubated without any antibody were prepared in each experimental run. The appearance of ovarian tissues was carefully checked during vitrification and warming. Vitrified ovarian tissue was always found to be translucent, indicating no ice formation (Figure 2). In addition, there was 89% survival of oocytes obtained from bovine ovarian tissue after vitrification and warming (Table 1). There was no difference in the findings between fresh and vitrified–warmed bovine ovarian tissue. The cooling rate was determined to be 17,000°C/min. The warming rate of samples (38°C) was determined to be 23,000°C/min. A total of four ovarian tissues were successfully autotransplanted to two cattle. In these two cattle, histological analysis 44 days later indicated normal tissue architecture after transplantation (Figure 5). In fact, there was no evidence of any difference in the architecture or number of follicular structures in transplanted ovarian tissue that had been vitrified using the Cryotissue method (Table 2). Oestrogen concentrations were measured in four cattle after ovariectomy and ovarian tissue transplantation (Figure 6). In all of these cases, there was a prompt recovery of oestrus cycles 2 months after the transplant. Human ovarian tissue from ovarian cancer patients was vitrified with the same technique as used for cattle. After warming, a high oocyte viability rate (89%) was also obtained in humans, not significantly different from fresh human tissue in these older women (Figure 7, Table 3). Gross morphology of the vitrified tissue was translucent, verifying no ice crystal formation (Figure 8). Normal histology in vitrified human ovarian tissue was also demonstrated (Figure 9), with completely normal follicles and blood vessels, and with no visible sign of damage. Abundant proliferating cells (PCNA-positive cells) were detected in the stroma and granulosa compartments in vitrified as well as fresh human ovarian tissue (Figure 10). Recent medical advances have dramatically increased the cure rate for cancer in young women of reproductive age, resulting in more than 90% of all young cancer patients to be cured (Bleyer, 1990; Gloeckler Ries et al., 1999). One of the adverse effects of cancer treatment, however, is infertility brought about by damage to the ovaries caused by chemo- and radiotherapies. Almost all female patients with haematological cancer who undergo bone marrow transplants lose their ovarian function and become menopausal, regardless of age, and are thus rendered sterile. Approximately 1% of the total female population between 20–39 years of age in Japan are cancer survivors whose fertility has been destroyed by their treatment (Cancer Statistics Digest, 2007). The solution to this dilemma would be to freeze the eggs or ovarian tissue of these patients before the initiation of cancer treatment. The recent development of ultra-rapid cooling vitrification has now made possible the cryopreservation of mature oocytes so that cancer patients may eventually still be able to have children. Vitrification of oocytes can also be utilized for young women who need to delay childbearing until their later years for personal reasons. A bank for patients’ oocytes was originally established in 2001, utilizing ultra-rapid cooling vitrification, and the oocytes of many unmarried cancer patients have already been reliably cryopreserved (Katayama et al., 2003). In addition, more than 400 healthy babies have been born in 12 countries, including Japan and the USA, from non-cancer patients whose oocytes had been cryopreserved using ultra-rapid cooling vitrification (Lucena et al., 2006; Cobo et al., 2007; Nagy et al., 2007; Homburg et al., 2008). However, there are many cancer patients who cannot avail themselves of oocyte cryopreservation because they require immediate therapy and will not be allowed to delay cancer treatment for the month of drugs that is typically required before retrieving oocytes. Furthermore, pre-pubertal girls cannot undergo stimulation for transvaginal oocyte retrieval. In addition, it is only the possibility of having children in the future that can be preserved by oocyte freezing. It cannot restore natural hormonal function, and if those few frozen eggs do not result in pregnancy (as with any IVF cycle), the woman has lost her chance. These limitations of oocyte freezing may be solved if efficient cryopreservation of the ovary or ovarian tissue were possible. It would allow the emergency retrieval of ovarian tissues, regardless of the timing of the patient’s menstrual cycle, as well as retrieval from pre-pubertal girls, thereby avoiding any delay in cancer treatment. It would also enable the preservation of fertility in baby girls suffering from paediatric cancer, or Turner’s syndrome. Furthermore, cryopreservation of ovary or ovarian tissue can open more reproductive possibilities for the patient because it can allow the preservation of very large numbers of oocytes. If frozen ovarian tissue is autotransplanted back to the patient, a natural, spontaneous pregnancy can occur in preference to IVF–embryo transfers (Silber et al., 2005, 2007, 2008). Furthermore, when the transplanted ovary begins functioning and hormone secretion resumes, the patient will be able to lead a normal life without any hormone replacement therapy. Figure 5. Histological section of vitrified bovine ovarian tissue 44 days after autotransplantation. The graft is above the dotted line and the original cortex is under the dotted line. Interstitial tissue of the graft was as good as in the original bovine ovary. The blood vessels (V), oocytes (O) and follicles (F) of the graft were also morphologically normal with no sign of diminution in numbers. Haematoxylin–eosin staining. Scale bar represents 50 μm. Table 2. Number of surviving follicles in vitrified and fresh ovarian tissue after transplantation in cattle. (a) The number of follicles in vitrified and fresh ovarian tissues were counted in a limited area (1 × 10 mm) of these tissue sections under a microscope with a magnification power of ×400. Figure 6. Oestradiol (pg/ml) concentrations in four cattle that underwent vitrified ovarian tissue transplantation. Two months after transplantation, all cows experienced two consecutive oestrus cycles and raised oestradiol concentrations after equine chorionic gonadotrophin injections. In the present study, cryopreservation of ovarian cortical tissue was studied rather than cryopreservation of the intact whole ovary because transplantation of cortical tissue is so much easier to perform than microvascular whole ovary transplantation [see news video] (Gosden et al., 1994; Arav et al., 1996; Silber et al., 2008a,b). The success of the technique presented here depends upon the thinness of the sample (less than 1 mm). For both slow cooling and vitrification to achieve a high rate of cell viability after the cryopreservation and thawing/warming processes, there must be rapid permeation of CPA into cells with the right concentration, and fluid withdrawal from the cells to prevent intracellular ice formation. Both slow freeze and vitrification, therefore, depend on having very thin cortical tissue strips. Reports on cryopreserved and fresh ovarian tissue transplantation so far have proven that it is not necessary to transplant the whole ovary in order to restore ovarian function. Excellent results were reported for fresh ovarian tissue transplantation between monozygotic twins using approximately 1 × 20 × 20 mm tissue graft by Silber et al. (2005, 2007, 2008). Based on the fact that more than 10 babies have been born through natural pregnancy after ovarian tissue transplantation using tissue graft of similar sizes and the fact that, in vitrification, the fastest cooling speed achieves the highest rate of post-cryopreservation viability, the minimum size for the ovarian tissue graft was set at 1 × 10 × 10 mm, and developed an appropriate vitrification method. The slicer was developed to cut 1 × 10 × 10 mm sections from the ovary repeatedly. The tissue slicer and device for cryopreservation would also be useful for other organs. The new slicer was developed for collection of ovarian tissues by laparoscopy. The conventional slow-cooling method certainly has resulted in the delivery of several babies (Meirow et al. 2005; Donnez et al. 2004a,b; Andersen et al. 2007; Demeestere et al. 2007; Silber et al. 2008). But there are still few successful cases despite the many years in which it has been tried, and the ovarian function usually degraded either after the delivery (Donnez et al., 2004a; Meirow et al., 2005; Silber et al., 2008a) or within 3 years. The post-thaw viability for oocytes in ovarian tissue by slow-cooling cryopreservation is as low as approximately 50%, but there is also a massive loss of oocytes due to ischaemia (Baird et al., 1999; Fauque et al., 2007). Fauque et al. (2007) reported that the percentage of unstained follicles considered live was lower (P < 0.015) after slow-freezing–thawing (71.9%) than before cryopreservation (87.3%). They used the slow-freezing methods from Gosden et al. (1994). After freezing–thawing, tissue morphology was preserved, but immunohistochemical analysis shows a significant increase in the apoptosis process. In-situ detection of apoptosis, on deparaffinized tissue sections, showed an increase of apoptotic follicles after freezing–thawing. The TdT (terminal deoxynucleotidyl transferase)-mediated dUDP nick-end labelling (TUNEL)-positive nuclei, in oocytes and follicular cells, after freezing and thawing were equal to 29% versus 10.9% before freezing (P < 0.05). For cytoplasmic apoptotic markers, activated caspase 3 labelling was found at 32.4% before freezing and at 63.1% after freezing–thawing (P < 0.05). Kim et al. (2004) warned that much still remains to be done to explain the ultrastructural damage observed in frozen–thawed tissue. Therefore, more apoptosis could be attributable to ischaemic injuries during the different times of the ovarian cortical tissue cryopreservation procedures. Figure 7. Surviving oocytes (arrows) of pre-antral follicles of vitrified–thawed ovarian tissue in human (Hoechst/propidium iodide stain). 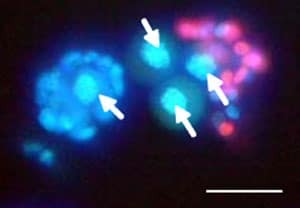 Nuclei of living oocytes were blue. Scale bar represents 50 μm. Table 3. Survival of oocytes in vitrified–warmed human ovarian tissue. Figure 8. Gross morphology of vitrified human ovarian tissue using the Cryotissue method. Vitrified human ovarian tissue was translucent in liquid nitrogen (–196°C). Scale bar represents 10 mm. Figure 9. Morphologically normal oocyte in a pre-antral follicle from vitrified-warmed human ovarian tissue. (A) Normal oocyte was surrounded by one or two layers of somatic cells in normal interstitial tissue of vitrified ovarian tissue. Haematoxylin–eosin staining. (B) Normal oocyte was surrounded by three or four layers of somatic cells in normal interstitial tissue of vitrified ovarian tissue. Scale bar represents 50 μm. The two keys to long-term survival of ovarian tissue grafts are to obtain as rapid a revascularization as possible (so as to minimize ischaemic loss of oocytes) as well as to minimize loss of oocytes from freezing damage. Both of these two prime objectives can be achieved by making the grafts as thin as possible, but of course, not being so thin that the primordial follicles are excluded. The ideal thickness appears to be 0.75–1.0 mm (Figure 11). For several decades it had been reported that oocytes cryopreserved with the slow-freezing method resulted in the delivery of babies (Oktay et al., 2006). However, the reason why the cryopreservation of oocytes has not become widely used, even though it has been more than 20 years since the first reported case, is the very low post-cryopreservation viability obtained with the slow-cooling method. The number of successful cases of oocyte cryopreservation using the slow-cooling method where the oocytes resulted in babies adds up to only a few percent. he number of successful cases is also low when ovarian tissue is cryopreserved. So in view of the dramatic success with fresh cortical grafts, this study investigated whether post-thaw and transplant viability might be improved (Silber et al., 2008a). The first aim was to establish a safe and efficient cryopreservation method that could be applied to clinical practice that can reduce freezing damage to the ovarian tissue. The favourable effect that this would have on ischaemic loss was not anticipated. There are many different groups of cells in ovarian tissue, including various developmental phases of oocytes and granulosa cells. Among those, the oocyte in the pre-antral follicle, which is thought to have the least resistance to freezing, was chosen as an object of study. Various experiments were conducted, making post-thaw viability the parameter for the evaluation of the cryopreservation technique. Figure 10. Histological section of vitrified human ovarian tissue. Immunohistochemical staining for proliferating cell nuclear antigen (PCNA), a marker protein for proliferating cells. Abundant PCNA-positive proliferating cells were demonstrated in the interstitial tissue cells and a few proliferating cells were noted in granulose cells (arrows) of vitrified human ovarian tissue. Scale bar represents 50 μm. The ultra-rapid cooling Cryotissue vitrification method yielded an extremely high post-cryopreservation viability (difference between fresh and cryopreserved) for bovine ovaries. As every slaughtered cow in Japan is obliged to undergo testing for BSE (bovine spongiform encephalopathy), the ovaries used for the cryopreservation examination had been kept in physiological saline for a whole day at 15°C after being isolated until the BSE test result was obtained, and then the cryopreservation examination was started. The viability of oocytes recovered from the pre-antral follicle in fresh ovarian tissue as well as that which had been cryopreserved and processed in the same manner was 89%. In other words, there was essentially no additional loss of oocyte viability due to the process of ultra-rapid cooling vitrification. The examination of the cryopreservation of the mouse ovary using this ultra-rapid cooling vitrification method (Kagawa et al., 2007) yielded, similarly, an extremely high oocyte viability rate. The oocytes recovered from the cryopreserved tissue resulted in many normal offspring, and all demonstrated normal fecundity. The present experiment in bovine and human ovarian tissue yielded a similarly high post-warming viability using the same vitrification method. Ultrasound also revealed normal follicular growth in the grafted ovary. Most importantly, the transplanted vitrified–warmed bovine ovarian tissues were, in all the cases, histologically normal. Figure 11. All oocytes (arrows) were located in the cortical area of the human ovarian tissue. Note that they were all located within 0.75 mm of the surface, allowing much thinner slices to be made than can be obtained by hand, or than have been used in previous studies. Scale bar represents 1 μm. There was not only no apparent loss of oocyte viability caused by the vitrification, but even the transplantation of this cortical tissue resulted in no histologically apparent ischaemic oocyte loss either. Histological analysis of ovarian tissue cryopreserved with the slow-cooling method has demonstrated subtle aberrations compared with fresh tissue (Kuchenmeister and Kuwayama, 1997). However, as shown in Figure 5, the vitrified bovine ovarian tissue in this study showed normal morphology not only for the oocytes, but also for the follicles and blood vessel distribution, for both post-cryopreservation/warming and post-transplantation phases. After autotransplantation, the follicles in the vitrified–warmed ovarian tissue developed via rapid angiogenesis in the surrounding tissue, restoring ovarian function with minimal ischaemic loss. Thus it is likely that, with this method of cryopreservation, a much longer duration of function for ovarian cortical grafts can be anticipated. Based on these findings in the cow, it was presumed the Cryotissue method used in these experiments could be applied to human ovarian tissue, the structure of which is similar to that in cattle. So human ovarian tissues were vitrified using this same approach. As shown in Table 3, the viability of oocytes in human ovarian tissues vitrified with ultra-rapid Cryotissue method was also very high (90%). There was no significant difference between fresh and frozen tissue even though the donors of the ovaries were patients with ovarian cancer of a rather advanced age (38–40 years old). Human ovarian tissue (which has a similar structure to bovine ovarian tissue) behaved similarly to bovine ovarian tissue following vitrification. Histopathological analysis of post-vitrification human ovarian tissues demonstrated normal tissue structure after vitrification, similar to the results obtained from the bovine experiment. No devitrification occurred during warming, and excellent viability was demonstrated, indicating that this may now be an acceptable method for clinical trials. These results suggest that human ovarian tissue may be preserved safely with ultra-rapid cooling vitrification using the Cryotissue method and that ovarian function may be fully restored after transplantation of vitrified–warmed tissue. Autotransplantation of this tissue in cows indicates that even the ischaemic loss of oocytes can be obviated, thus most likely increasing the duration of function of human cryopreserved ovarian grafts. This method therefore has promising potential for clinical use in rescuing the fertility of cancer patients, and also for extending the reproductive lifespan of non-cancer patients. The authors would like to thank Professor Shozu (Chiba University) for his valuable suggestions. The authors are grateful to Mr Hirata (Iwate University) and Dr Ohtani (NITTEN) for performing ovarian tissue transplantation in cattle. The collaborative efforts and technical assistance of the following personnel are also gratefully acknowledged: Ms Mori, Ms Takayama, Ms Satoh, Ms Sugiyama and Ms Lenahan. Thanks are also due to Ms Fuller for her preparation of the manuscript. Andersen C, Loft A, Ernst E et al. 2007 Assisted reproductive techniques after autotransplantation of frozen/thawed ovarian tissue. In: Abstracts of the 23rd Annual Meeting of the European Society of Human Reproduction and Embryology. Human Reproduction 22 (Suppl. 1), i41. Arav A, Zeron Y, Leslie SB et al. 1996 Phase transition temperature and chilling sensitivity of bovine oocytes. Cryobiology 33, 589–599. Baird DT, Webb R, Campbell BK et al. 1999 Long-term ovarian function in sheep after ovariectomy and transplantation of autografts stored at -196°C. Endocrinology 140, 462–471. Bleyer WA 1990 The impact of childhood cancer on the United States and the world. CA: a cancer journal for clinicians 40, 355–367. Cobo A, Kuwayama M, Perez S et al. 2007 Comparison of concomitant outcome achieved with fresh and cryopreserved donor oocytes vitrified by the Cryotop method. Fertility and Sterility 89, 1657–1664. Courbiere B, Odagescu V, Baudot A et al. 2006 Cryopreservation of the ovary by vitrification as an alternative to slow-cooling protocols. Fertility and Sterility 86 (Suppl. 3), 1243–1251. Demeestere I, Simon P, Emiliani S et al. 2007 Ongoing pregnancy after a second cryopreserved ovarian tissue transplantation procedure. In: Abstracts of the 23rd Annual Meeting of the European Society of Human Reproduction and Embryology. Human Reproduction 22 (Suppl. 1), i43. Donnez J, Dolmans MM 2004 Livebirth after orthotopic transplantation of cryopreserved ovarian tissue. Letter. Lancet 364, 2092–2093. Donnez J, Dolmans MM, Demylle D et al. 2006 Restoration of ovarian function after orthotopic (intraovarian and periovarian) transplantation of cryopreserved ovarian tissue in a woman treated by bone marrow transplantation for sickle cell anaemia: case report. Human Reproduction 21, 183–188. Donnez J, Dolmans MM, Martinez-Madrid B et al. 2005 The role of cryopreservation for women prior to treatment of malignancy. Current Opinion in Obstetrics and Gynecology 17, 333–338. Donnez J, Dolmans MM, Demylle D et al. 2004 Live birth after orthotopic transplantation of cryopreserved ovarian tissue. Lancet 364, 1405–1410. Fauque P, Ben Amor A, Janne C et al. 2007 Use of trypan blue staining to assess the quality of ovarian cryopreservation. Fertility and Sterility 87, 1200–1207. Fuentes F, Dubettier R 2004 Air separation method and plant, United States Patent. Patent No. US 6,776,005 B2. Gloeckler Ries LAG, Percy CL, Bunin GR 1999 Introduction. In: Ries LAG, Smith MA, Gurney JG et al. (eds) Cancer Incidence and Survival among Children and Adolescents: United States SEER Program 1975-1995. National Cancer Institute, SEER Program, Bethesda, MD, USA. Gook DA, Edgar DH, Stern C 1999 Effect of cooling rate and dehydration regimen on the histological appearance of human ovarian cortex following cryopreservation in 1,2-propanediol. Human Reproduction 14, 2061–2068. Gosden RG, Baird DT, Wade JC, Webb R 1994 Restoration of fertility to oophorectomized sheep by ovarian autografts stored at –196 degrees C. Human Reproduction 9, 597–603. Homburg R, van der Veen F, Silber SJ 2008 Oocyte vitrification – women’s emancipation set in stone. Fertility and Sterility [e-publication ahead of print]. Kagawa N, Kuwayama M, Nakata K et al. 2007 Production of the first offspring from oocytes derived from fresh and cryopreserved pre-antral follicles of adult mice. Reproductive BioMedicine Online 14, 693–699. Katayama KP, Stehlik J, Kuwayama M et al. 2003 High survival rate of vitrified human oocytes results in clinical pregnancy. Fertility and Sterility 80, 223–224. Kim SS, Yang HW, Kang HG et al. 2004 Quantitative assessment of ischemic tissue damage in ovarian cortical tissue with or without antioxidant (ascorbic acid) treatment. Fertility and Sterility 82, 679–685. Kuchenmeister U, Kuwayama M 1997 Successful vitrification of GV stage bovine oocytes by in-straw dilution method. Theriogenology 47, 169. Kuwayama M, Vajta G, Kato O et al. 2005a Highly efficient vitrification method for cryopreservation of human oocytes. Reproductive BioMedicine Online 11, 300–308. Kuwayama M, Vajta G, Ieda S et al. 2005b Comparison of open and closed methods for vitrification of human embryos and the elimination of potential contamination. Reproductive BioMedicine Online 11, 608–614. Kuwayama M, Holm P, Jacobsen H et al. 1997 Successful cryopreservation of porcine embryos by vitrification. The Veterinary Record 141, 365. Lippe B 1991 Turner syndrome. Endocrinology and Metabolism Clinics of North America 20, 121–152. Lucena E, Bernal DP, Lucena C et al. 2006 Successful ongoing pregnancies after vitrification of oocytes. Fertility and Sterility 85, 108–111. Martino A, Songsasen N, Leibo SP 1996 Development into blastocysts of bovine oocytes cryopreserved by ultrarapid cooling. Biology of Reproduction 54, 1059–1069. Meirow D, Levron J, Eldar-Geva T et al. 2005 Pregnancy after transplantation of cryopreserved ovarian tissue in a patient with ovarian failure after chemotherapy. New England Journal of Medicine 353, 318–321. Migishima F, Suzuki-Migishima R, Song SY et al. 2003 Successful cryopreservation of mouse ovaries by vitrification. Biology of Reproduction 68, 881–887. Nagashima H, Cameron R, Kuwayama M et al. 1999 Survival of porcine delipated oocytes and embryos after cryopreservation by freezing or vitrification. Journal of Reproduction and Development 45, 167–176. Nagy ZP, Chang C-C, Shapiro D et al. 2007 Clinical evaluation of the efficiency of oocyte donation program using egg cryo-banking. Fertility and Sterility 88, S42–S43. Newton H, Aubard Y, Rutherford A et al. 1996 Low temperature storage and grafting of human ovarian tissue. Human Reproduction 11, 1487–1491. Oktay K, Cil AP, Bang H 2006 Efficiency of oocyte cryopreservation: A meta-analysis. Fertility and Sterility 86, 70–80. Oktay K, Buyuk E, Veeck L et al. 2004 Embryo development after heterotopic transplantation of cryopreserved ovarian tissue. Lancet 363, 837–840. Oktay K, Economos K, Kan M et al. 2001 Endocrine function and oocyte retrieval after autologous transplantation of ovarian cortical strips to the forearm. Journal of the American Medical Association 286, 1490–1493. Rall WF, Fahy GM 1985 Ice-free cryopreservation of mouse embryos by vitrification. Nature 313, 573–575. Silber SJ, Gosden RG 2007 Ovarian transplantation in a series of monozygotic twins discordant for ovarian failure. New England Journal of Medicine 356, 1382–1384. Silber SJ, DeRosa M, Pineda J et al. 2008a A series of monozygotic twins discordant for ovarian failure: Ovary transplantation (cortical versus microvascular) and cryopreservation. Human Reproduction 23, 1531–1537. Silber S, Grudzinskas G, Gosden RG 2008b Successful pregnancy after microsurgical transplantation of an intact ovary. New England Journal of Medicine 359, 2617–2618. Silber SJ, Lenahan KM, Levine DJ et al. 2005 Ovarian transplantation between monozygotic twins discordant for premature ovarian failure. New England Journal of Medicine 353, 58–63. Sugimoto M, Maeda S, Manabe N, Miyamoto H 2000 Development of infantile rat ovaries autotransplanted after cryopreservation by vitrification. Theriogenology 53, 1093–1103. Taya K, Watanabe G, Sasamoto S 1985 Radioimmunoassay for progesterone, testosterone and estradiol-17β using 125I-iodohistamine radioligands. Japanese Journal of Animal Reproduction 31, 186–197. Vajta G, Kuwayama M, Holm P et al. 1998 Open pulled straw vitrification: A new way to reduce cryoinjuries of bovine ova and embryos. Molecular Reproduction and Development 51, 33–58. Weiss L 1971 Additional evidence of gradual loss of germ cells in the pathogenesis of streak ovaries. Journal of Medical Genetics 8, 540–544.